Gmail’s new inbox – like having a meticulous friend come round to clean your house! Google is currently rolling out a new look inbox to all Gmail users. I have been using Gmail for some years now as my main email account. The service is excellent – it has always been very good at dealing with spam, I love the fact that the search bar in Gmail works as quickly and efficiently as Google itself, and it’s also a really easily recognisable address – helps when giving your address on the ‘phone. At first I was a bit freaked out – when a software company moves things around it’s a bit like when they move things at the supermarket. 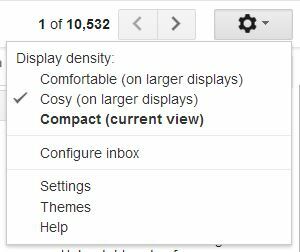 When Google changes your email settings it’s more like someone’s come in and cleaned your office and changed your filing system. It felt a little bit intrusive initially. However, after the initial disorientation I am now really liking the new set up. I can see at a glance whether a new email is something I need to pay attention to. If I want I can just keep an eye on ‘Primary’ and leave the other tabs for tidying up at a set time each day. The phone app has been updated in the same way – although currently I’m finding the web based version easier to use. You can switch the whole thing off if you want but I would encourage you to give it a trial for a week and see how you like it – I’m finding it very useful. It’s like having an OCD friend come round and clean your house! @vahva My reaction was exactly the same Bryony! "I don't like this, oh no I hate it, oh….oh that actually makes sense!"